University of North Dakota men's hockey head coach Dave Hakstol said today that UND forward T.J. Oshie (Warroad, Minn.) has decided to forego his final season of college eligibility and has signed a professional contract with the National Hockey League's St. Louis Blues. The Blues drafted Oshie in the first round (24th overall) of the 2005 NHL Entry Draft. Oshie is only the second player to ever be drafted from the State of Washington with David Wilkie being the other. 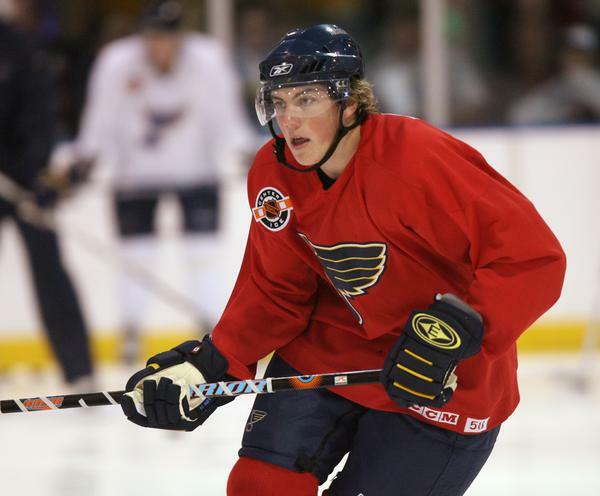 Following his 10-year career at Seattle Jr. Hockey Association where he played for the Northwest Admirals AAA program from Mites through Bantams, Oshie traveled east to eventually play his prep hockey for the Warroad H.S. Warriors. At Warroad, Oshie led the Warriors to two, Minnesota State Class A Championships in 2003 and again in 2005, which in 2005 his team finished undefeated (29-0-2) for the first time in the 63-year history of Warroad hockey. 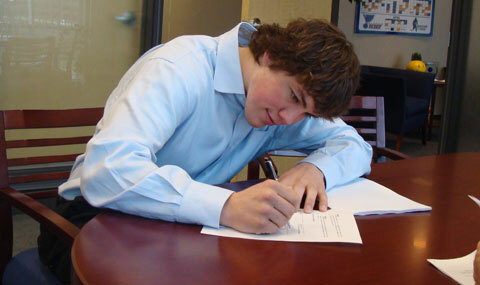 In 2005, Oshie was selected as Seattle Junior Hockey Association's, Male Player-of-the-Decade. In November of 2005, he was honored as the Minnesota Indian Education Association's, Male Athlete-of-the-Year Award. It's an honor very near and dear to his proud, Chippewa Indian heritage. Oshie is of 1/4 Ojibwe descent. Oshie was selected to the MN State Hockey All-Tournament Team all three years he played at Warroad and was a 2005 Minnesota Mr. Hockey Finalist. While at Warroad, Oshie compiled an amazing 104 goals, 137 assists for 241 points in only 93 games. He left Warroad as the All-Time Leading Scorer in it's storied history. He led the State of Minnesota in scoring his senior year with 37 goals, 63 assists for 100 points. His Warriors' captured the 2005 MN State Championship in double overtime over Totino-Grace Academy, 4-3. On the final play, Oshie won a face-off in the T-G zone and while diving on his stomach slid a perfect pass to Aaron Marvin who netted the state championship game-winner. Warroad had won it's fourth, MN State Class A title and Oshie left Warroad with a 85-5-3 record and never missed a game in his career at Warroad. Oshie, who played three seasons for UND, finished the 2007-08 season with a team-high 45 points in 42 games while leading the team in assists (27) and tying for the team lead in goals (18). This past season Oshie was an American Hockey Coaches Association first team West All-American and first team All-Western Collegiate Hockey Association forward, and he was also a Top 10 Hobey Baker Memorial Award finalist. Oshie is one of just 15 players in school history to be named a finalist for the Hobey Baker Award, awarded annually to college hockey's best player. Oshie also earned all-tournament honors at the WCHA Final Five and NCAA Midwest Region championship. Hakstol said he wished Oshie well as he begins his professional career. "Two years running T.J. has been voted by his teammates as the Cliff 'Fido' Purpur Award winner (given to the UND player who demonstrates hard work, determination and being a creator of excitement on the ice)," said Hakstol. "I think this honor says it all in terms of T.J.'s on-ice performance. He is an equally outstanding person off the ice. Throughout his time in the program, T.J. has handled both his successes and challenges with great class and composure. Over his three years here at UND, he has demonstrated that he truly understands what it means to put on the Fighting Sioux jersey. We look forward to watching the next phase of his career as he steps into the National Hockey League with the St. Louis Blues organization." 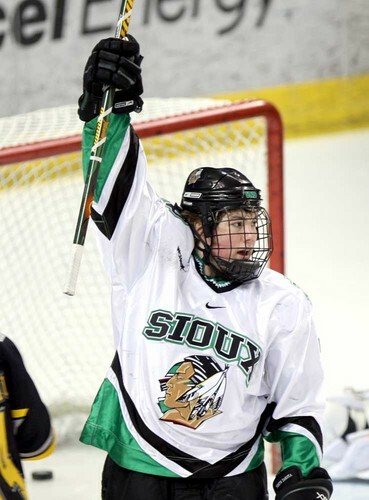 In his three-year Fighting Sioux career, Oshie had 142 points (59 goals, 83 assists) in 129 games. His 142 points rank 30th all-time in UND history, and his 16 career game-winning goals are second only in school history to Mark Taylor's 18 from 1976-80. Oshie helped the Sioux advance to the NCAA Frozen Four in all three of his seasons at UND. As a freshman in 2005-06, Oshie tied for the team lead in goals (24), while compiling 45 points in 44 games. He was a WCHA All-Rookie team selection and also made the WCHA Final Five all-tournament team. Oshie led the nation and set a school record with nine game-winning goals in his rookie season. 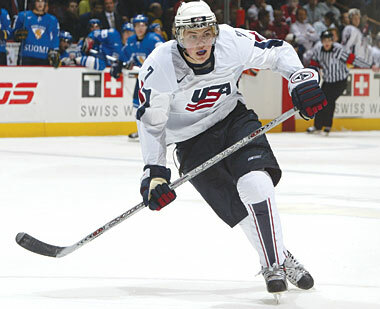 During his freshman campaign, Oshie also represented the United States at the 2006 World Junior Championships in Vancouver, British Columbia. As a sophomore in 2006-07, Oshie earned third team All-WCHA honors and finished second on the team in scoring with 52 points, tallying 17 goals and 35 assists. He had 34 points (12 goals, 22 assists) in his final 20 games and led the nation with eight points (4 goals, 4 assists) in the NCAA tournament. "I have decided to pursue my dream of playing in the NHL next season with the St. Louis Blues organization.This could not have become possible without the help of my fans, coaches, and teammates. Thanks to the fans who have stood behind me through the good and bad times. You are truly the best fans in college hockey. A special thanks to the coaching staff for teaching and guiding me to become the best hockey player and man I can be. Most of all I would like to thank my teammates. My success is directly related to our team success. You have become my lifelong friends and I would 'go to war' with you guys any day. I have had the time of my life at UND and am very proud to have worn the Sioux sweater and added to its tradition. I would also like to wish 'the boys' the best of luck next year! I'll be watching."